Bastian Schweinsteiger is a German footballer, who has been a symbol of the German national team for many years. Fans associated the name Schweinsteiger with success, and brilliant football skills. At the same time, coaches distinguished Bastian’s reliability and stability. Unfortunately, the football player has already completed his career in the German national team, but Schweinsteiger’s fans still do not lose hope to see the idol on the field playing for the national team. The future footballer was born on August 1, 1984, in the German town of Kolbermoor, in the south of Bavaria. Bastian has done sports since childhood, although Schweinsteiger was not engaged only in football. His first hobby was skiing. The boy's parents had their ski shop and encouraged their son's hobbies. 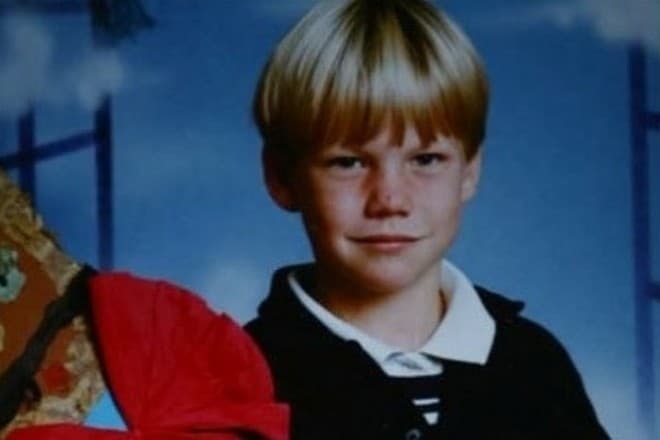 But Schweinsteiger’s younger brother, Tobias, chose football and even achieved remarkable success on the field, which attracted Bastian's attention to this sport. Soon Bastian decided to give up skiing and began attending football training. The representatives of Bayern Munich noticed the talented boy and invited him to train in the club. In the beginning, it was difficult for Schweinsteiger because the young man went to Munich every day. The city was 70 km far from his native town. It took a long time to go there, and soon they gave Bastian temporary accommodation in Munich. At the age of 16, Schweinsteiger already joined the reserve team of Bayern Munich thanks to his talent and dedication. The turning point in Bastian Schweinsteiger’s sports career was 2002, when the football player went on the field as part of the Bayern Munich first team, although he was a substitute. In a while, Bastian already made his debut in the Champions League matches, scoring his first goal for his native Bayern. Schweinsteiger began next season as an official player of the Bayern first team. The coaches and commentators emphasized the midfielder’s impeccable technique, as well as his sports calmness and ability to instantly analyze the situation on the field and choose the right game strategy. Soon Bastian took the position of central midfielder and was recognized as the best player in the team. In 2015, the news about Bastian Schweinsteiger’s transfer to Manchester United caused a stir among football fans all over the world. The rumors and speculation about the reasons for the change of the team and the player’s transfer fee spread on the Internet. They said that Schweinsteiger preferred a higher salary. They also often suggested that the Bayern coach was thinking of replacing Schweinsteiger with another football player. The athlete preferred not to comment on this situation in an interview. 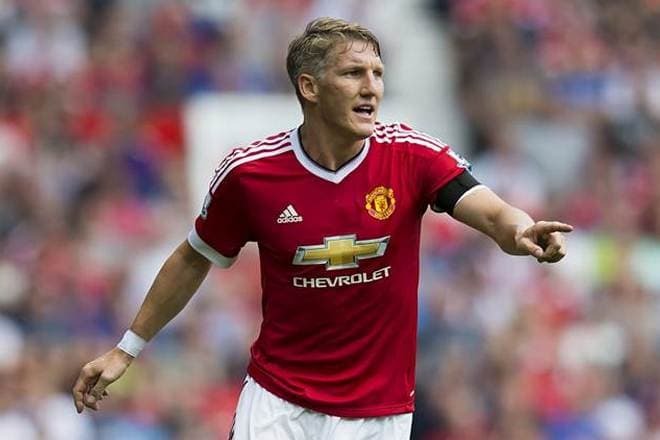 Be that as it may, but in the next season, Bastian already played in a new club, Manchester United. Unfortunately, Schweinsteiger could not bring out his full potential in the new team. Bastian was out of the action due to injuries and subsequent aftercare. Fans even worried about the health of the athlete. Moreover, when José Mourinho became a coach, the player was sent to the youth team. Schweinsteiger was not satisfied with the situation, and soon rumors about Bastian's next transfer appeared again. This time, the American club Chicago Fire bought the player. The contract is valid until 2018. Throughout his club career, Bastian Schweinsteiger also played for the national team. The first match for the German national team was in 2004. Bastian was on the field as a member of the national team for 12 years. He participated in four European Championships and three FIFA World Cups. The football player has become the best player in the national team, and he regularly showed new achievements on the field. The idol made the fans upset only once when at the Euro 2008 Bastian was sent off during the match against Croatia, and the German team lost 1: 2. However, in the next match (against the Portuguese team) Bastian Schweinsteiger did his best, scoring one goal and setting up the other two. In 2016, at the end of the European Championship, Schweinsteiger, the famous lucky number seven of the national team, announced his retirement from the national team. The handsome blond man (Bastian Schweinsteiger's height is 183 cm, and the weight is 79 kg) has never complained of his personal life. For a long time, the media discussed the love affair of the football player with model Sarah Brandner. However, the relationship did not work out, and the lovers separated. The next famous love affair was relations with the Serbian tennis player, Ana Ivanovic. In 2014, the girl agreed to become the football player’s wife. 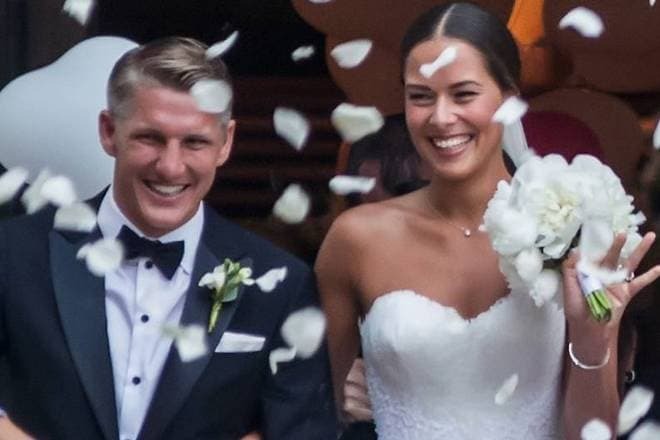 Schweinsteiger and Ivanovic’s wedding took place in the romantic atmosphere of Venice, and fans discussed photos of this event for a long time. Besides football, Bastian is interested in cars, and the athlete has several cars. The football player has repeatedly confessed to journalists that he loves to cook and even studied culinary arts under a famous Bavarian chef. At the same time, the sports star is not persnickety about his food, prefers a traditional salad with turkey and toothsome steak. In 2018, a son, Luca, was born in the family. Ana Ivanovic posted a photo of the boy on the Instagram, sharing her joy. Bastian tells that he has always dreamt of children and is very happy to become a father. The athlete watches with interest the main football event of the year – the 2018 FIFA World Cup. Bastian Schweinsteiger wished the German team luck on Twitter, wrote that he believed in the strength of the team. Unfortunately, Bastian's expectations did not materialize, and Germany went home after the final match of the group stage against South Korea. 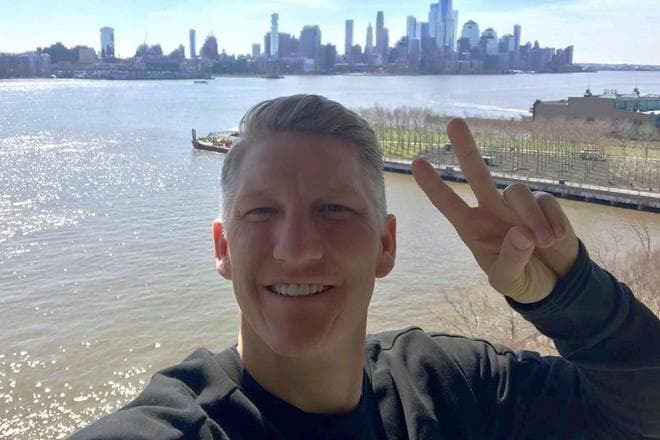 Nowadays Schweinsteiger tries to devote more time to his wife and son, but fans are looking forward to new matches with the participation of their favorite athlete.